I got this idea while running on the treadmill. No joke. 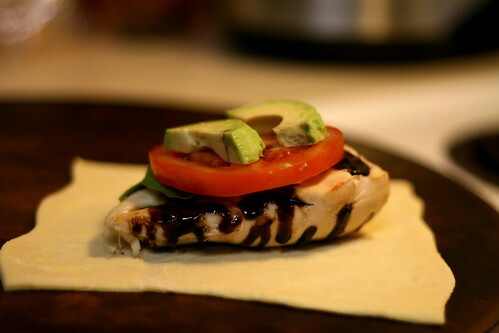 Something similar was happening on 30 Minute Meals with Rachel Ray–similar in that she was wrapping meat in puff pastry sheets, but totally different meat and filling–and it’s been stuck in my head ever since. You know how songs get stuck in your head sometimes? Yeah, that happens to me too, but with recipes. Sometimes they are awesome, and sometimes they totally bomb. My track record is pretty 50-50 whether or not these recipes actually work. The elements of this recipe were spectacular. 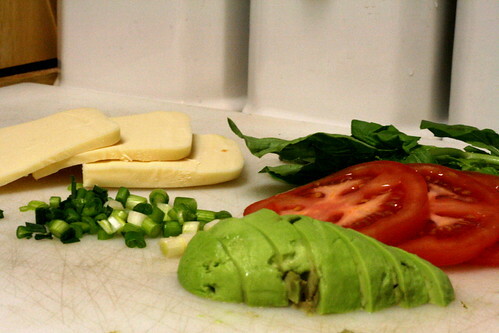 Avocado, basil, tomato, mozzarella and green onion. Layered inside puff pastry (which was surprisingly hard to find at Safeway). There are only two things I’ll do differently next time: no tomato and more basil. The tomato made the pastry dough very soggy and hard to completely bake, and the basil got lost amidst everything else. 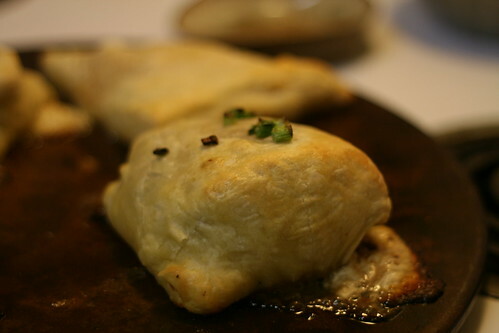 But truly, it’s hard to go wrong with flaky pastry, moist chicken and melted mozzarella cheese! I liked it very much, but Nick hates–and I mean hates–soggy, doughy things. He gave it a valiant effort, and was very nice about it, but I could tell that he wouldn’t eat this version again happily. No worries! The cool thing about my recipes is that they’re just general guidelines. I can add or subtract whatever I like. Next time, everyone will be happy. After thawing the puff pastry, cut into 4 squares. 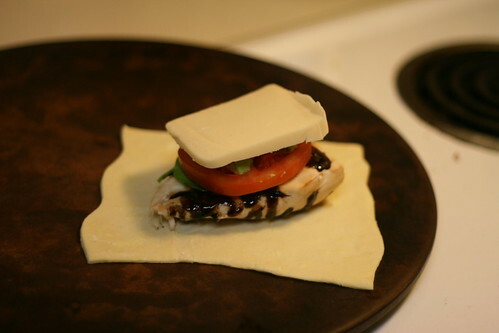 On each square, layer: basil leaf, half of a chicken breast, basil leaf, mozarella and avocado. 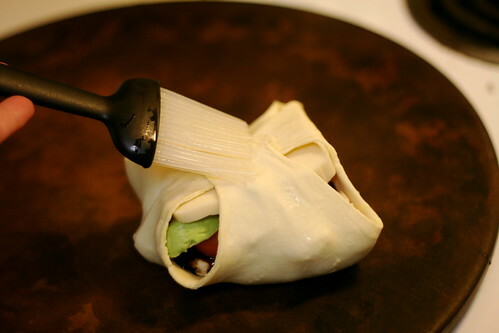 Begin pulling the corners of the pastry over top of the fillings. Brush the corners with the egg wash, and gently press to seal. Don’t worry if the packets aren’t totally sealed. 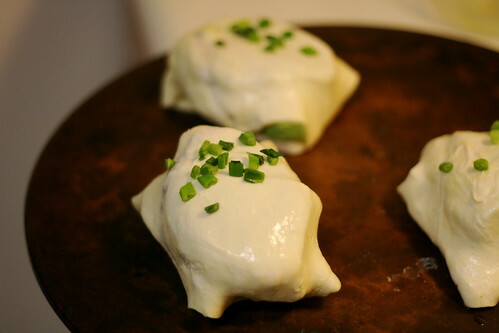 Flip the completed packet over and brush with the egg wash, then top with green onion. Bake for about 25-30 minutes. Do you ever get crazy ideas stuck in your head? Do you ever act on them? Wow Jessica! this looks amazing. I just made some additions to my shopping list… Awesome pics too! 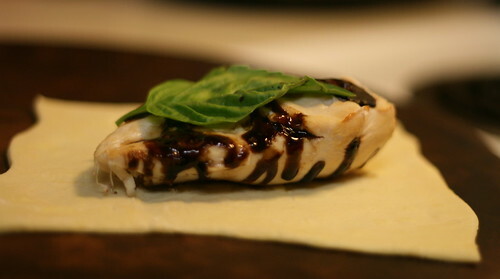 The balsamic glaze is really good on just about everything. Have fun! Let me know how it goes Erica! I’m new to your website and I can’t wait to explore more! 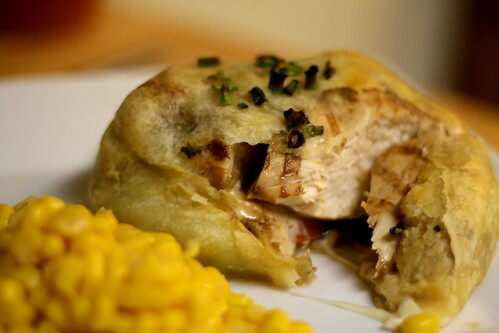 I make something pretty similar to this, and call it “company chicken.” I cook the chicken in the skillet (or bake) with simple salt, pepper, garlic powder, then wrap chicken topped w/ cheddar cheese (be generous) and wilted spinach (dry this out) in 4 triangles (2 rectangles) of croissant dough. Bake until golden brown – delicious. I love the flavor from the croissant and the cheese together. Try it and let me know how you like it! Mmmmm, that does sound delicious! I’m so glad other people get recipes stuck in their head too! This sounds fantastic. When I cook with tomatoes and don’t want them soggy I just slice them up and use my fingers to get rid of the inner “guts” – voila not soggy. That would definitely work! Thanks for the tip. The tomato really adds a lot of flavor in there, so I definitely don’t want to leave it out entirely.